COOKED vs RAW: How Should I Weigh Food When Tracking Macros? A lot of people will argue that there's no difference when it comes to weighing COOKED and RAW ingredients. We know that both options are trackable, but which option is the accurate option? Tracking macros go hand in hand with weighing your food. It's a no-brainer. But did you know that there is a significant difference in weighing your foods raw and cooked? Here's why you should weigh RAW every time. Weighing your food AFTER it has been cooked can cause a lot of discrepancies for several reasons. While some prefer to weigh out their food once all cooking is over for convenience's sake, putting in the extra hard yards to pre-weigh your ingredients will ensure that what you're entering is ACCURATE. Raw ingredients have not been affected by cooking methods or a loss or gain in the volume of liquid present. Ever notice how much mushrooms shrink when you cook them? Imagine 100g of raw mushrooms. Now imagine cooking them for a few minutes in a frying pan. They will shrink slightly and may reduce down to around 75g. Now cook the mushrooms for a further 10 minutes. The mushrooms are now 40g with the water evaporating and reducing in the pan. This is where the discrepancies occur. You cannot prepare and cook foods the same way every time to ensure that what you enter into MyFitnessPal reflects the true macronutrient breakdown of the food. 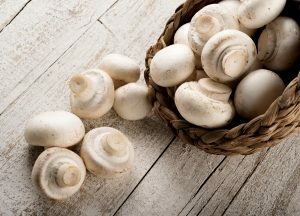 If you enter the mushrooms in as 100g raw, its end weight won't affect your entry! Tracking RAW takes any chance of preparation affecting the true macros out of the equation. A common question we get here at THE BOD is: How do I weigh my meals out once cooked ensuring that there is an equal amount of protein, carbohydrates and fats in each of my meal prep containers? Follow these steps to help with weighing food AFTER the cooking process. Make sure all elements of your dish have been weighed raw. If possible, keep the protein separate in a different bowl. Weigh your curry and divide the weight by the number of serves needed. Repeat this step for your protein. Measure out equal weights of the curry and beef into your containers. If your protein and curry are already mixed through, don't stress. While the protein measurement won't be as accurate, remember that your body responds to consistency. If each serve of protein should be 100g per day, but some days there is less and some days more, your average intake of beef is still going to be 700g by the end of the week. For more information on tracking and weighing your food to hit your own unique goals, check out our women's and men's 12-week nutrition and exercise programs. Remember: When weighing food, always weigh raw and uncooked where possible.